Spot it! (a.k.a. 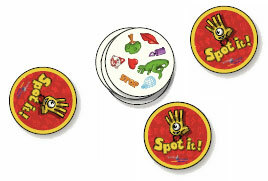 Dobble in Europe) is an quick matching game in which players try to find an image shown on two or more cards. Each of the 55 cards has 8 different symbols. Between any 2 cards, there is always one (and only one) matching symbol. The players must spot it first to win! 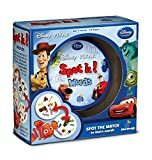 The game play is so simple and that's what makes it so much fun for families to play together. 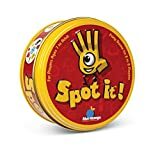 There are multiple ways to play Spot it! 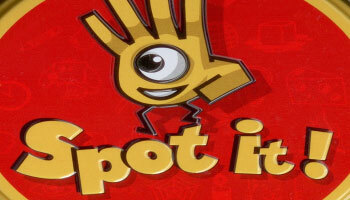 because of the different mini-games and this makes it a really addictive competing observation game. Shuffle the cards, place one face down in front of each player and make a draw pile with the remaining cards, which will be placed face-up in the middle of the table. Be the player who has gained the most cards from the draw pile when the game ends. On go, the players flip their card face-up.